The Day the Books Took Off is a sited piece in the International English Library for the ‘Stadtprojekt: Wenn die Häuser Trauer Tragen’ – (When the Buildings Carry Grief) as part of Impulse Festival. The extension to the Wilhelm-Marx-Haus (one of the first skyscrapers in Europe when it was built in 1924) currently houses a number of public institutions, among them the Forum Freies Theater as well as the library which currently occupies the top floor. The 1980s extension is the last public space in the centre of Düsseldorf. The current city government is putting the site up for sale and some institutions will be rehoused elsewhere in the city. Five artist groups work with different institutions in the Wilhelm-Marx-Haus and the week long event includes group tours and performances for 2 people at a time, culminating in an Abscheidsfest (farewell party) to the building and its institutions. The Day the Books Took Off is situated in the reading area at the back of the library on green leather chairs. Our project looks at the situation from the books point of view and inspired by female surrealist painters of the 1940s & 1950s, we take them to have a life of their own their own as birds who are leaving the nest of the library (established in 1946 as a gift from the British Occupying Forces and run by volunteers since the 1990s) and getting ready to roost elsewhere. 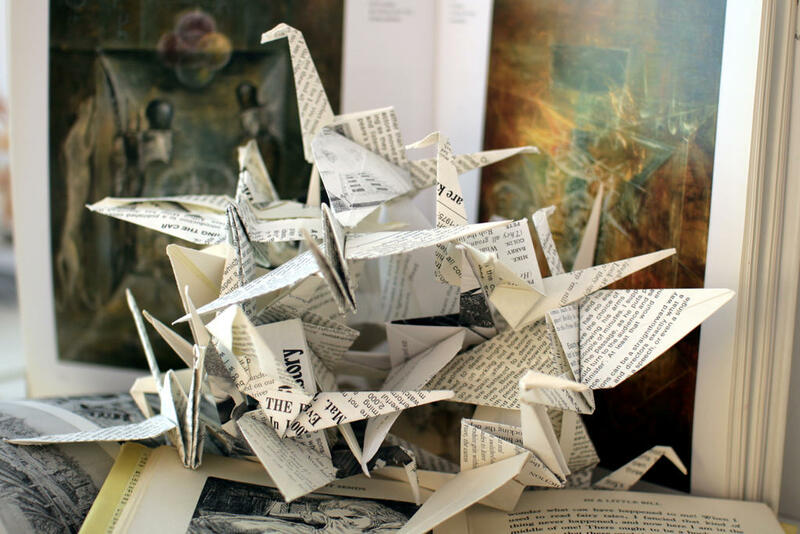 As part of their move, the library has been culling books and so we have used them to make objects and paper cranes that we invite the audience to let go into of from the second floor stairwell. As you watch it twirling, falling like a sycamore key, remembering the tree it once was and the bird it is now, you might want to say goodbye to the presence of this library here. 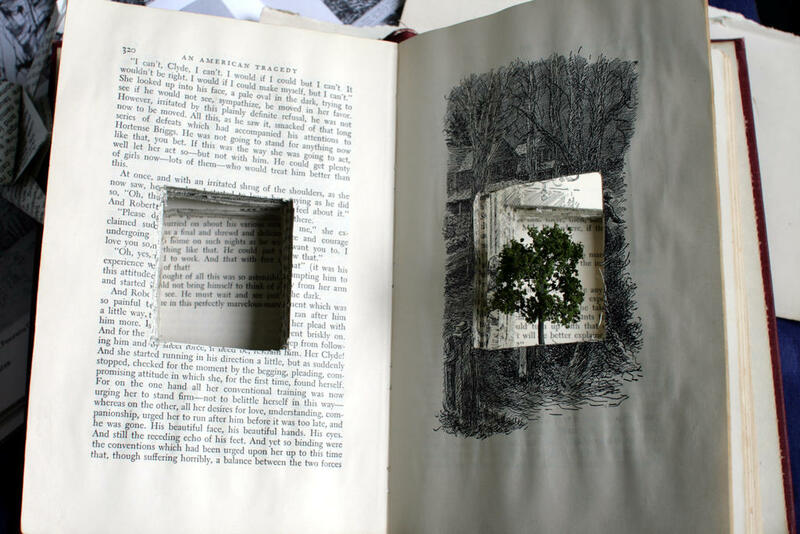 The materiality of books is celebrated and mourned as more and more public libraries are threatened and councils in Germany and the UK ‘cut back’ on public spaces and services. The Day the Books Took Off was commissioned by Haiko Pfost for the Impulse Festival Stadtprojekt 2018.